Story: Diagnosed with non Hodgkin’s lymphoma February 2008 (junior year of high school). Cancer free as of October 2008! A: I’m so fortunate that it’s been 7 years since I was diagnosed and I am generally very healthy – I sometimes forget I even had cancer! A: Before I was diagnosed I was a vegetarian for 3 years. I came back to the dark side because it gave me more meal options while I was in the hospital, but I keep threating to go veggie again. I haven’t totally pulled the trigger yet, but I try to participate in Meatless Mondays and choose vegetarian options when I can. You don’t have to go completely meatless to be healthy though, I firmly believe that balance and moderation is key with a healthy diet. Thankfully my doctors don’t seem too concerned with my cancer returning but they have warned me of many “late effects” I could experience. As a young, healthy 24 year old it’s hard to remember those now, but I try to remind myself that someday those long 7 months of chemo will catch up to me. Living a healthy lifestyle is the only thing that will keep those issues away for as long as possible. A: Reminding myself of the fight I went through to become healthy again after my diagnosis. I don’t want to go through anything like that again. 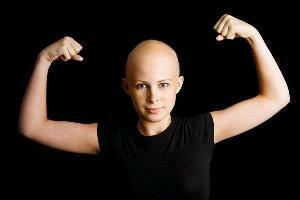 Q: Losing loved ones to cancer is extremely difficult, how does that impact your opinions about fighting the disease? A: We have to do everything in our power to prevent it, but unfortunately that’s not always enough. Genetics are a crazy thing and we need more research. After a diagnosis, it’s important to fight as hard as possible with a positive attitude. I believe that positive thoughts are so powerful and can be that one thing that ties every component of treatment together to make it successful. Q: Its great to get advice from experts; But its more important sometimes to hear advice from ordinary people that we can all relate to. So… what’s your advice for someone that wants to make a change in his or her life? A: Be positive and have a plan. There have been many times I’ve fallen off the healthy eating and exercise train. Whenever I’ve tried to hop back on without a plan or a positive attitude, it hasn’t worked. But when I have both of those things it’s so much easier! A: I have a friend, who isn’t a cancer survivor, but she had a liver transplant at the same hospital and around the same time I went through treatment. We didn’t meet until college but she has definitely gone through hell since her transplant and seems to be doing great now. Her name is Sabrina Wiechmann.